Admittedly, calendar watches are convenient, especially when it comes to full calendars (the one that display the day, the date and the month). In a glance, it allows you to have a look at all the calendar datas. So, when you mix it with an icon like the Zenith El Primero (yes it is, both the movement and the watch that includes it), with an inspired look and a great quality, it brings you quite a package (something we were sure about at the time of its introduction). This watch has a name, the Zenith El Primero 410 Triple Calendar and MoonPhase Chronograph and we had it for a while on the wrist. Hands-on review. 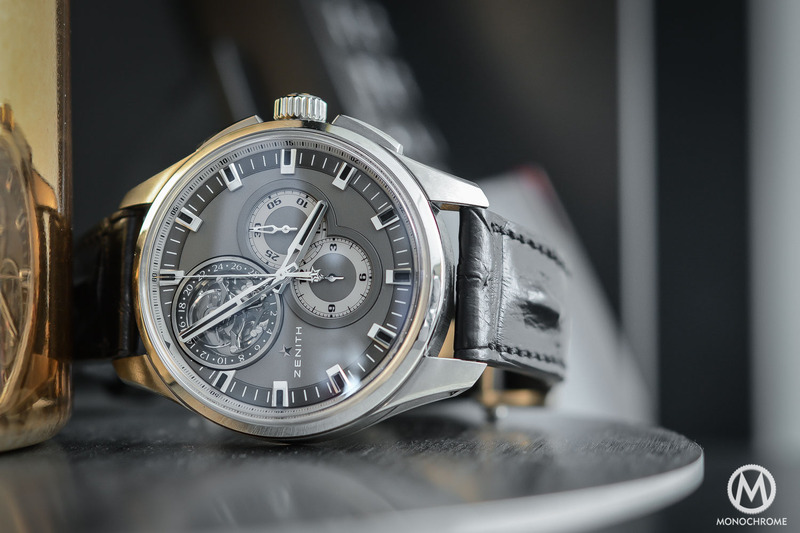 A sporty, balanced elegance can define Zenith El Primero 410 Triple Calendar and MoonPhase Chronograph. It’s not our first time with this watch, as we’ve already covered it in 2014 when Zenith presents it to the public and we’ve been briefly touching it, in a blue dial edition, at Baselworld 2015. However, you know the truth for a long time now: nothing is comparable to a proper test, with the watch in question strapped on your wrist for a longer period. And while the blue dial is a nice addition to the catalogue, we’ll stick to the more classical, timeless silver edition today, probably easier to match on a daily basis. 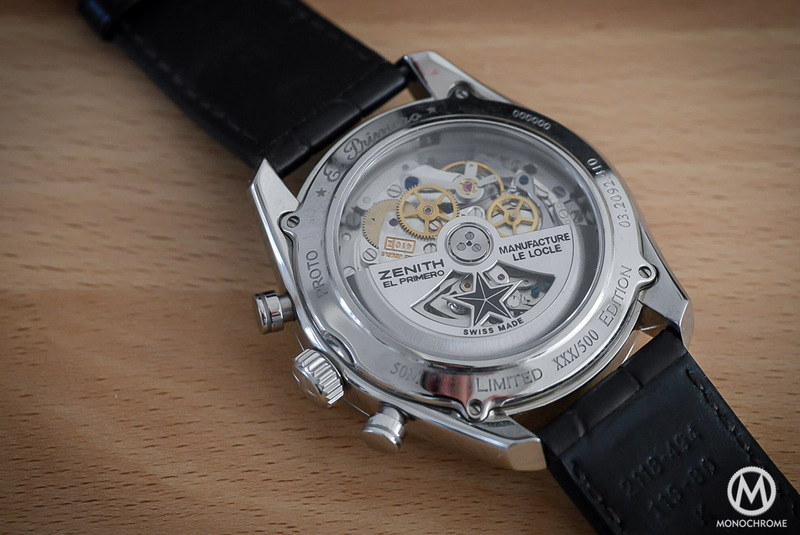 Before going into this Zenith El Primero 410, a quick historical reminder. 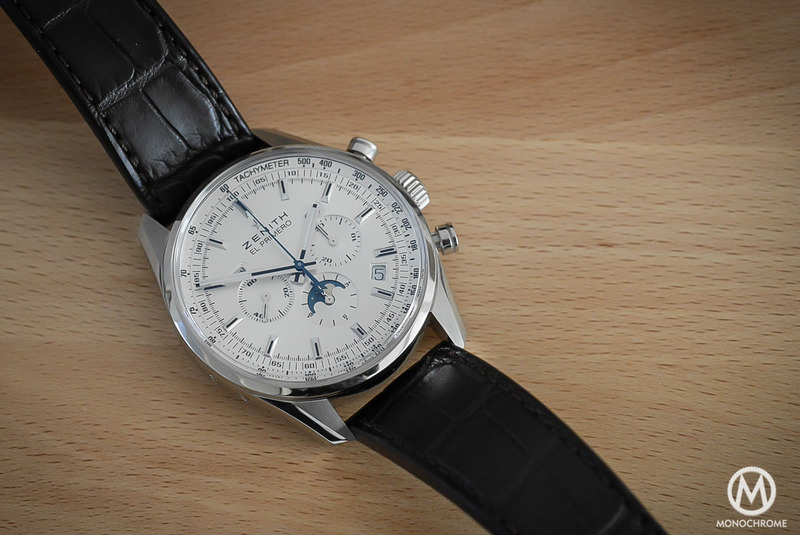 The Zenith El Primero (the movement) is born in 1969 and was – alongside 2 other movements from Seiko and Buren / Heuer / Hamilton / Breitling – the first automatic chronograph movement. However, none of these 3 movements are identical and the technical solutions chosen are all unique. The Heuer Calibre 11 was a modular micro-rotor movement, the Seiko 6139 had a classical integrated architecture with column wheel, something shared by the El Primero. 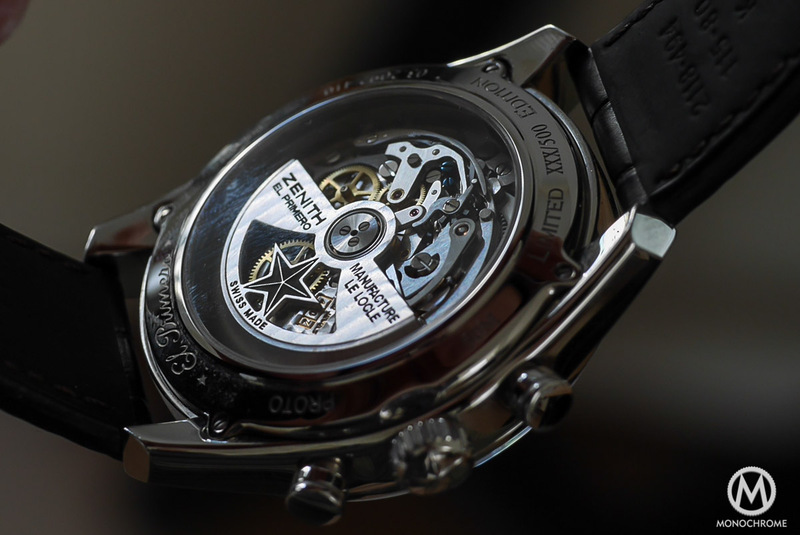 However, Zenith’s proposition was very unique in one way, as it featured (and still feature) an escapement that vibrates at 36,000 vibrations per hour, or 10 ticks per second. It’s a so-called high-beat movement – that is supposed to be more precise. 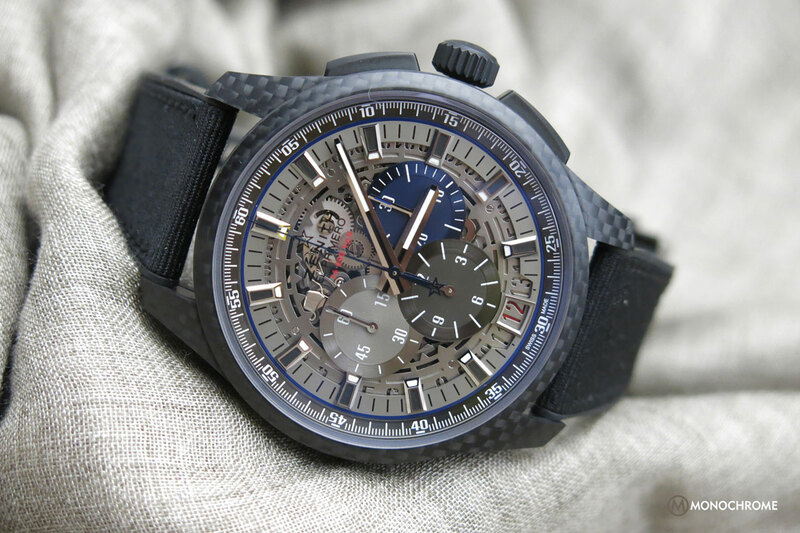 Experts do not entirely agree on who was first and there are quite a few factors that count: developing, patenting, introducing, producing, delivering… whatever, the Zenith El Primero was and still is one of the greatest chronograph movements ever made. Then cames the idea of mixing this movement with a complete calendar complication. This concept had been developed as a prototype in the late 1960s / early 1970s with a very limited production of approximately 25 pieces. 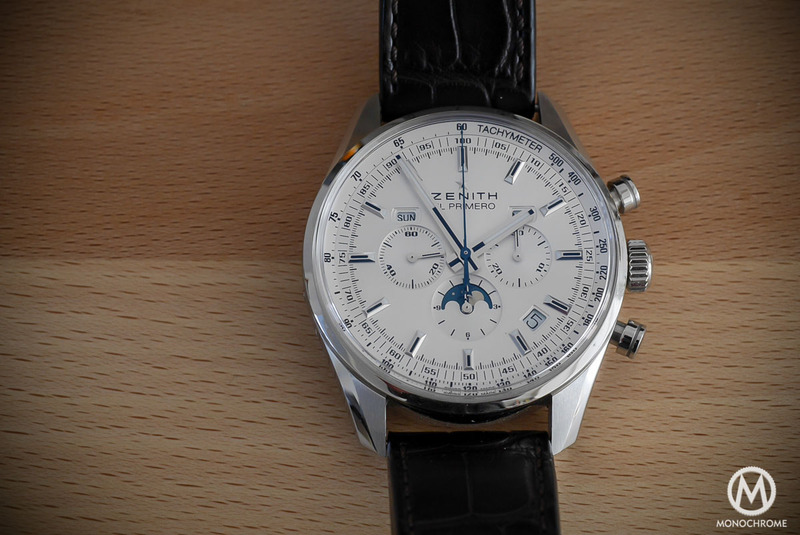 Then, Zenith introduced several watches with this same movement, including the Triple Date display – watches like this Chronomaster. However, this complication has never been seen in the classical case of the El Primero (the watch, not the movement) until 2013. For the story, one of the 25 prototype watches had been sold in May 2012 by Christies for 37.500 Swiss Francs and bought by Zenith themselves. 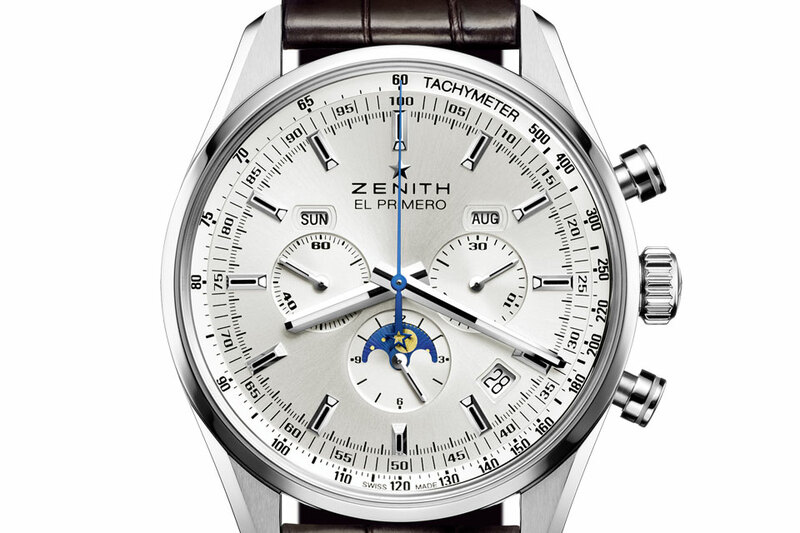 The goal of this acquisition: creating a new watch based on the El Primero and including this triple calendar. 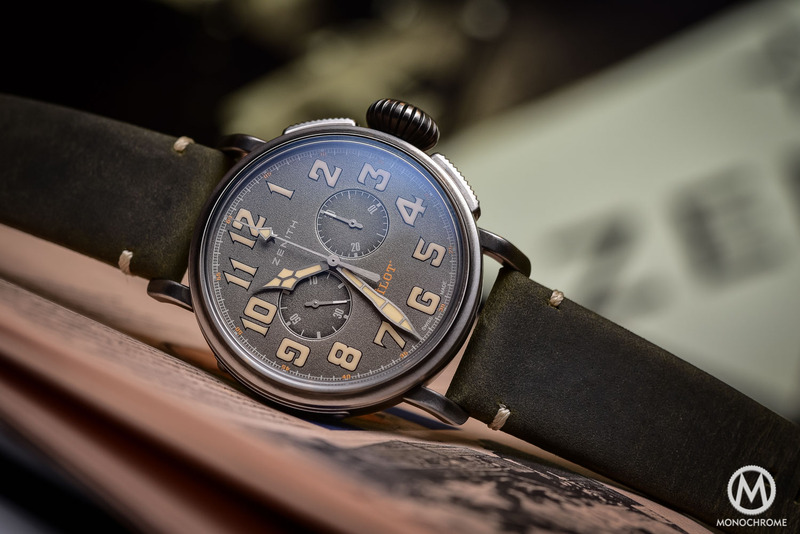 The result was first a limited edition of 500 watches launched in 2013, with a slate grey dial and two stars on the dial besides the day and month apertures – just like the vintage edition. 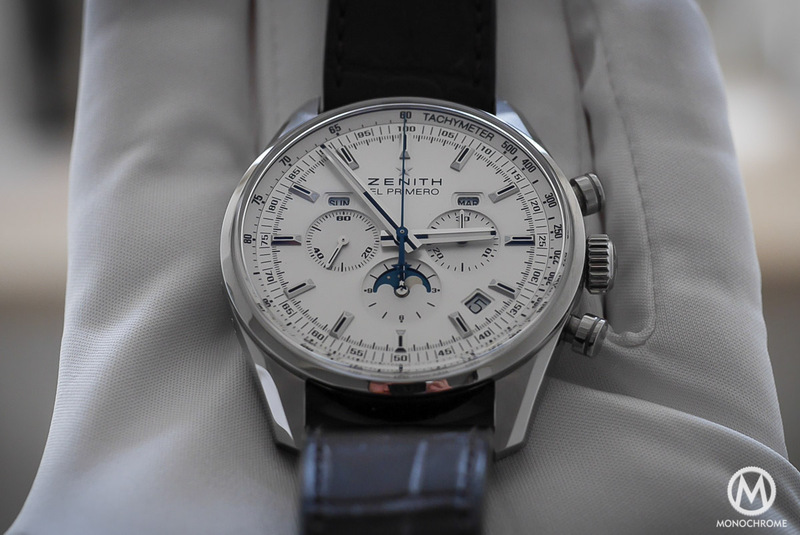 Considering the great success of this limited edition, Zenith decided to give its chance to the 410 movement and to launch it in a regular edition, the one you can see here. 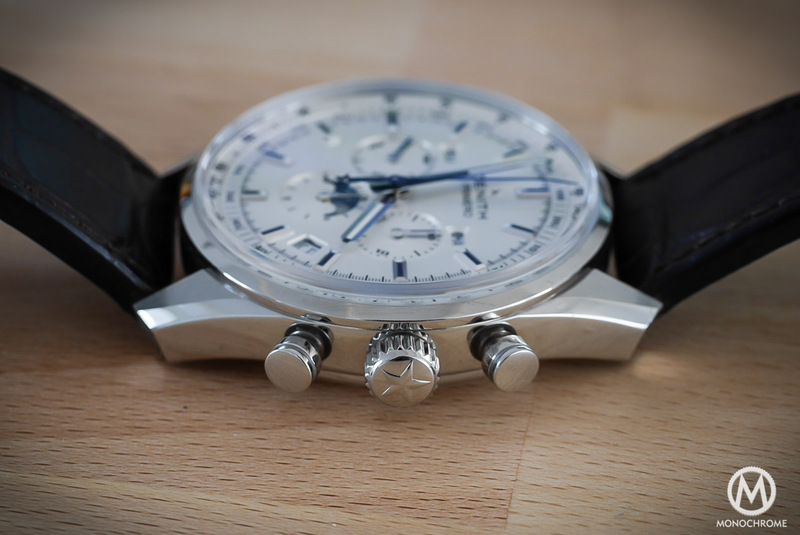 Back to the watch itself, the Zenith El Primero 410 Triple Calendar and MoonPhase Chronograph. It is a mix of modernity (size-wise especially) and of vintage feels (for the reference to the antique watch that inspired this edition, the shape of the case and the layout of the calendar). It also a watch mixing elegant design clues with the sportiveness of a chronograph and of a stainless steel case measuring 42mm. Well, this makes a lot of blends and sometimes, it can create a watch not strong, resolute or sharp enough – a watch that is a bit consensual and that doesn’t stand out of the crowd. No worries, it’s clearly not the case here and we can already tell you that this El Primero 410 Triple Calendar is one of the best editions of the collection. 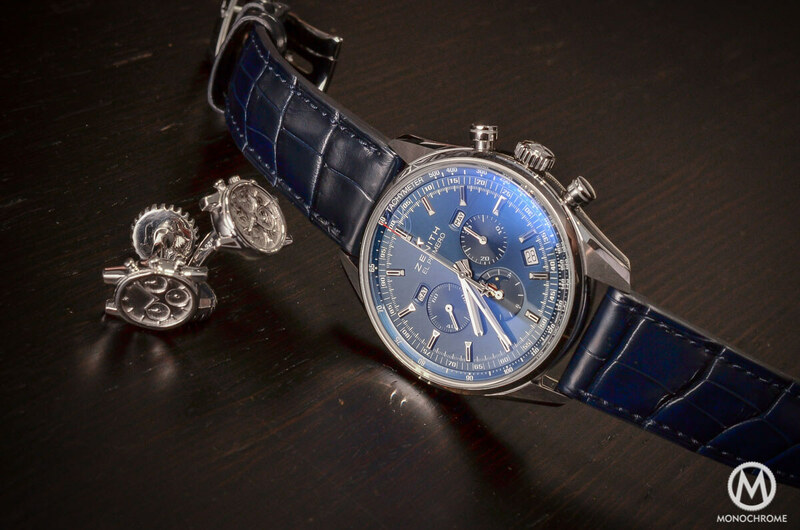 Design-wise, the Zenith El Primero 410 is faithful to the rest of the collection. The 42mm case in stainless steel features the original shape of the watch launched in 1969, with the specific flanks you can see on the photo above, defined by a large chamfer on top of the lugs and a pointy edges. The execution is great, with sharp angles and clean distinction between the different surfaces (polished on the casebands and lug-bevels and satined on the flat surfaces). The bezel is rather thin, leaving a wide opening for the dial. It gives a clear view on the indications and makes the watch rather thin and light but on the contrary, it also emphasizes the size of the case (especially on this bright silver execution). The case is already quite large (a bit too large actually – we’d love to see this triple calendar in the vintage 38mm case) and the large diameter of the silvery-white dial makes it virtually bigger. 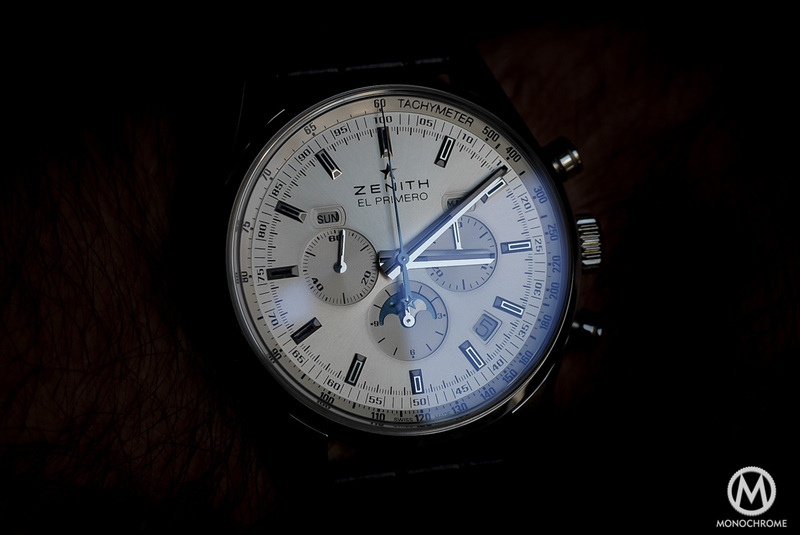 Nothing dramatic though, just be aware that this Zenith El Primero requires a slightly robust wrist. The dial also has the same both modern and retro feeling as the case. Retro because of the layout first, composed of a classical tri-compax chronograph (running second at 9, 30-minute counter at 3 and 12-hour counter at 6) together with well placed calendar indications (day at 10, month at 2 and date at 4:30). The moon phases are classically displayed in a sub-dial into the 12-hour counter at 6. Then again, it is very classical but the legibility, even considering the huge amount of indications, remains perfect and elegant. 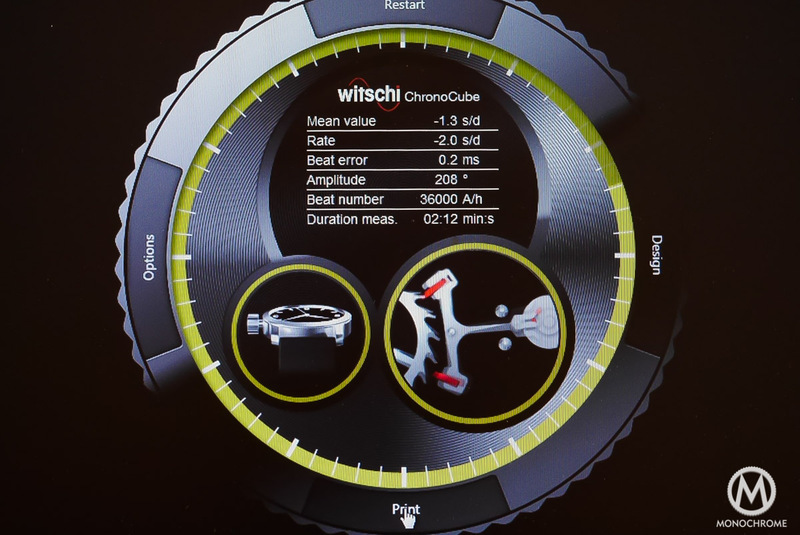 The overall dial is balanced and easy to read. The hands and the applied indexes are made in silver metal and filled with a contrasting blue paint, also visible on the chronograph hand and on the moon disc. The look is cold and quite monochromatic but it is discreet enough to be worn in every situations, making this Zenith El Primero 410 Triple Calendar a perfect daily watch. One thing can be noticed though and then again, it is related to the size of the watch. The El Primero movement isn’t really small at 30mm but as the dial is very large, the sub-dials feel a bit too centered, too clustered. This small issue is intelligently compensated by Zenith, with the use of not one but two scales around the dial. First, there’s a classical tachymeter scale printed on the inner flange. Then, on the periphery of the dial, in-between this tachymeter scale and the applied indexes, we can find a telemeter scale, making the edges of the dial more busy and balancing with the center of the dial. On the overall, this dial is quite classical, monochromatic, cold, a bit busy BUT it works really well. If the blue edition is a bit more lively, this one gains in distinction and vintage elegance. Movement-wise, no surprises as we found here the calendar edition of the Zenith El-Primero, so-to-say, an horological icon. This movement was and still is one the very few chronograph calibres to work at 5Hz. It has underwent a few evolutions within the years but the base is faithful to the movement launched in 1969 – why changing something that works? The view from the back is pleasant, due to nice finishes and a open view on all the technical elements (wheels, gears, column-wheel). The only modification on this Calibre 410 compared to a classical El Primero is the extra-calendar module on the top. The 410 is composed of 390 parts when the normal 400 features only 278 parts – quite a complicated module on the top. The several calendar indications are adjusted via pushers inserted on the left side of the case. This calendar is neither an annual or a perpetual one. Thus, it will need to be adjusted every two months – but then again, it’s only every two months. The interest of the 5Hz / 36,000 bph frequency is first to have an extremely smooth run of the hands but mainly to gain in accuracy. The faster a movement ticks, the more precise it should be. 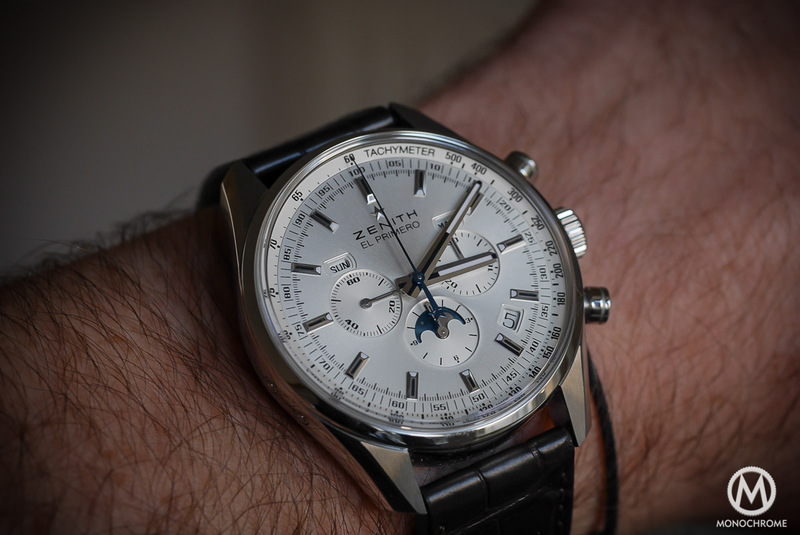 In the case of the Zenith El Primero 410 Triple Calendar and MoonPhase, we can actually confirm you a really precise run, as we tested it on Witstchi device to a mean value of -1.3 second per day. Quite impressive! 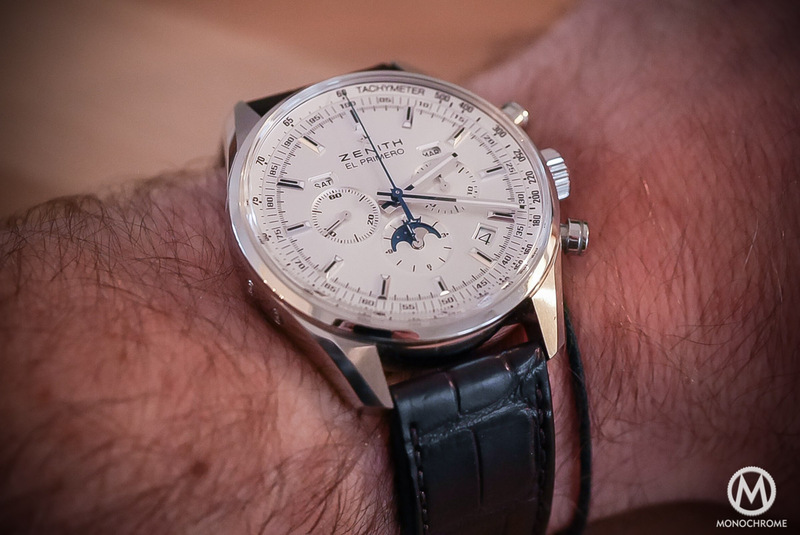 On the overall, this Zenith El Primero 410 Triple Calendar and MoonPhase is quite surprising as it is extremely classical at first sight, maybe too discreet and could be seen as to busy. However, it’s a watch that needs to be tested to understand its interest. After a few hours on the wrist, you experience an elegant, balanced chronograph, with a legible and practical dial displaying all the required indications (and even more). It has a strong presence on the wrist and doesn’t feel in the shadows of the typical tri-colour, non-calendar edition. Except a case that we’d like to be a bit smaller, it feels goods, looks good and works good. To sum up, a highly interesting alternative. Price: $11,000.